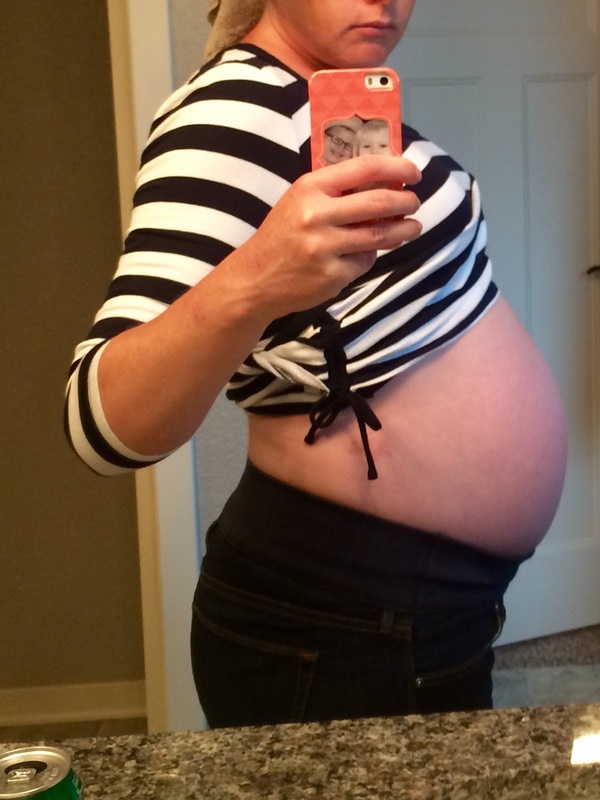 Movement: Baby is low (hence why I am writing this post), went the chiropractor today to get adjusted to keep baby from moving to sunny side up and keep my pelvic floor from rotating. Baby is still squirming around in there and I feel their little head down low moving around…like really low! Fetal Heartbeat: Once again baby was on the NST monitor for over an hour. First they got my heart tones and then when they readjusted baby was tired but I drank some water and had some candy and baby woke up giving them what they wanted…HR is right around 145-155 consistently. Sleep: I have not been needing as much sleep some days and have been going to bed really late for me – like 11pm and getting up around 7:30am. I take a nap somedays (especially chiropractor days) but still toss and turn and the overnight thunderstorms have not helped ;)! Symptoms: ouchy braxton hicks contractions that come and go but were measurable on the NST, ouch kicks way down low, some nerve pain from baby sitting on them (I just read that was what it was, it is ouchy! ), anxiety over the birth (with blood thinners and 2 healthy babies, I just pray this one comes out healthy and both of us do well!). Chiropractor has helped by putting a little acupuncture point for emotions and hormones…it could be worse ;). I do get crabby for no apparent reason and I try so hard to curb it because honestly I have no idea sometimes why I am crabby! On My Heart: I am not going to lie…one minute I am like “We are having a baby!” and can’t wait and then the next I get anxious about the delivery. Our deliveries haven’t been very smooth in the past with both kiddos coming sunny side and Vera’s cord wrapped around her neck, so going in those things are in the back of my mind plus things are progressing on their own with my body this time which is amazing but also makes me anxious given blood thinners. They assure me the blood thinners I am now on (heparin, we switched last week) wear off quickly and I might not get an epidural but other than that, baby and I should both be fine if I go into labor before induction day. I went to the chiropractor today (Dr. Jennifer is amazing, she helped flip baby and is trying her best to keep baby head face down 😉 and she said baby is right there (which I can feel ;). I am trying so hard to relish these days with my big kids, enjoy the last days of pregnancy but it is getting SO hard! I can’t believe we are nearing the finish line…and I so can’t wait to see Scott as a daddy again, my kids loving on this baby they have fervently prayed for for almost 2 years. We are all are just so excited. This baby is VERY loved. We have knocked out some major nesting to dos and I got the nurse gifts ready (because let’s face it they do 90% of the work), gifts from the baby to the big kids, the diaper bag with baby outfits packed, our house is mostly organized and purged, and for the most part deep cleaned. I just have to keep up on the laundry and never ending dirty dishes and toilets ;). Luckily Scott has been a champ helping me out and making me rest and watch a new show I found on Netflix (When the Heart Calls, highly recommend it). How many more of these posts will we have? Only God knows and I pray I can keep my eyes on Him and His plans for the end of this pregnancy because I know I need Him, I can’t do it alone!! !